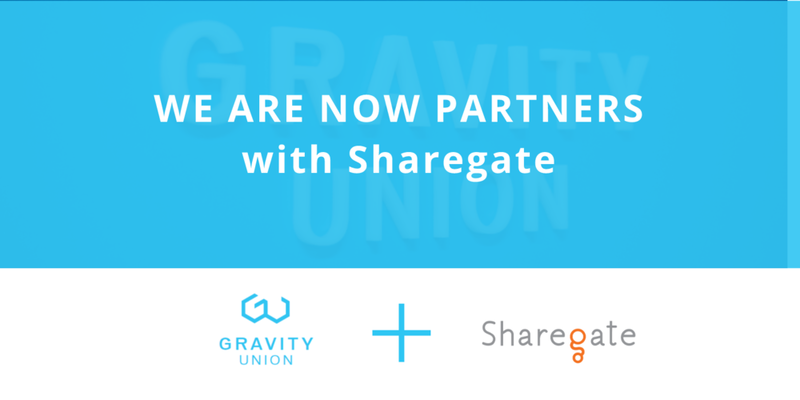 February 12th, 2018 (Vancouver, BC) – Gravity Union, a leading implementation partner of SharePoint and Collabware, today announced that it had joined the Sharegate Partner Program. The partnership grants Gravity Union with the ability to distribute Sharegate’s SharePoint and Office 365 content migration application across Canada. Additionally, Gravity Union will have the proper resources, training, and technology to provide implementation, support and customization services. “We are excited to see where this relationship takes us as we continue to empower organizations across Canada and US to take control of their information,” said Schweitzer. Gravity Union is a consultancy firm that specializes in creating user-focused ECM solutions built on the Microsoft stack including SharePoint, Collabware and Office 365. Founder Michael Schweitzer, one of the world's few Collabware MVP's, along with a team of specialized SharePoint and Collabware consultants bring over 40 years of combined experience in information technology and a passion for ECM.